Reflecting Cengage Learning's commitment to offering flexible teaching solutions and value for students and instructors, this new hybrid version features the instructional presentation found in the printed text while delivering all the end-of chapter exercises online in OWL, the leading online learning system for chemistry. The result-a briefer printed text that engages you online! Distinguished by its superior allied health focus and integration of technology, The Hybrid Edition with MindTap Reader of Seager and Slabaugh's CHEMISTRY FOR TODAY: GENERAL, ORGANIC, and BIOCHEMISTRY 8e meets students' needs through diverse applications, examples, boxes, interactive technology tools, and, new to this edition, real life case studies. 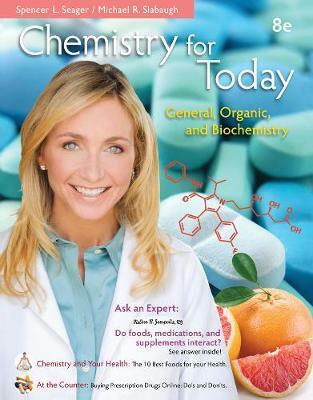 CHEMISTRY FOR TODAY dispels students' inherent fear of chemistry and instills an appreciation for the role chemistry plays in our daily lives through a rich pedagogical structure and an accessible writing style with lucid explanations. In addition, the book provides greater support in both problem-solving and critical-thinking skills-the skills necessary for student success. By demonstrating the importance of chemistry concepts to students' future careers, the authors not only help students set goals, but also help them focus on achieving them.